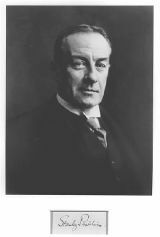 Stanley Baldwin, 1st Earl Baldwin of Bewdley, KG, PC (August 3, 1867 – December 14, 1947) was a British statesman and was elected three times to the position of Prime Minister of the United Kingdom. He dealt with labor unrest and the Ethiopian crisis of 1935, and the abdication of Edward VIII in 1936. He passed legislation ensuring complete adult suffrage in 1928. Baldwin has been ridiculed for his apparent complacency and failure to protect England from World War II, and for not standing against Hitler and Mussolini. Baldwin was born at Lower Park House, Lower Park, Bewdley in Worcestershire, England, Baldwin was educated at St Michael's School, Harrow and Trinity College, Cambridge. Upon graduation he joined the family business. He proved to be very adept at the family business of iron manufacturing, and acquired a reputation as a modernizing industrialist. Later, he would inherit £200,000 and a directorship of the Great Western Railway upon his fathers death in 1908. He married Lucy Ridsdale on September 12, 1892. In the 1906 general election he contested Kidderminster but lost amidst the Conservative landslide defeat after the party split on the issue of free trade. However, in 1908 he succeeded his deceased father, Alfred Baldwin, as Member of Parliament (MP) for Bewdley. During the First World War he became Parliamentary Private Secretary to Conservative leader Andrew Bonar Law and in 1917 he was appointed to the junior ministerial post of Financial Secretary to the Treasury. In this position he sought to encourage voluntary donations by the rich in order the repay the United Kingdom's war debt. He personally donated one fifth of his quite small fortune. He served jointly with Sir Hardman Lever, who had been appointed in 1916, but after 1919 Baldwin carried out the duties largely alone. He was appointed to the Privy Council in the 1920 Birthday Honors. In 1921 he was promoted to the Cabinet as President of the Board of Trade. In late 1922 dissatisfaction was steadily growing within the Conservative Party over its existing governing coalition with the Liberal David Lloyd George. Baldwin announced in October during a Parliament meeting, that he would no longer support the coalition and condemned Lloyd George for being a "dynamic force" that was bringing destruction across politics. The meeting chose to leave the coalition—against the wishes of most of the party leadership. As a result the new Conservative leader Andrew Bonar Law was forced to search for new ministers for his Cabinet and so promoted Baldwin to the position of Chancellor of the Exchequer. In the November 1922 general election the Conservatives were returned with a majority in their own right. In May 1923 Bonar Law was diagnosed with terminal cancer and retired immediately. With many of the party's senior leading figures standing aloof and outside of the government, there were only two candidates to succeed him: Lord Curzon, the Foreign Secretary, and Stanley Baldwin. The choice formally fell to King George V acting on the advice of senior ministers and officials. It is not entirely clear what factors proved most crucial, but some Conservative politicians felt that Curzon was unsuitable for the role of Prime Minister because he was a member of the House of Lords. Likewise, Curzon's lack of experience in domestic affairs, his personal character, and his aristocratic background at a time when the Conservative Party was seeking to shed its patrician image were all deemed impediments. Much weight at the time was given to the intervention of Arthur Balfour. The King turned to Baldwin to become Prime Minister. Initially Baldwin also served as Chancellor of the Exchequer while he sought to recruit the former Liberal Chancellor Reginald McKenna to join the government. When this failed he instead appointed Neville Chamberlain. The Conservatives now had a clear majority in the House of Commons and could govern for another five years before being constitutionally required to hold a new general election, but Baldwin felt bound by Bonar Law's old pledge at the previous election that there would be no introduction of tariffs without a further election. With the country facing growing unemployment in the wake of free-trade imports driving down prices and profits, Baldwin decided to call an early general election in December 1923 to seek a mandate to introduce protectionist tariffs and thus drive down unemployment. Although this succeeded in reuniting his divided party, the election outcome was inconclusive: the Conservatives won 258 Members of Parliament, labor 191 and the Liberals 159. While the Conservatives retained a plurality in the House of Commons, they had been clearly defeated on the central election issue of tariffs. Baldwin remained Prime Minister until the opening session of the new Parliament in January 1924, at which time the government was defeated in a motion of confidence vote. He resigned immediately. For the next ten months, an unstable minority Labor government under Prime Minister Ramsay MacDonald held office, but it too fell and another general election was held in October 1924. This election brought a landslide majority of 223 for the Conservative party, primarily at the expense of the now terminally declining Liberals. Baldwin's new Cabinet now included many former political associates of Lloyd George: former Coalition Conservatives Austen Chamberlain (as Foreign Secretary), Lord Birkenhead (Secretary for India) and Arthur Balfour (Lord President after 1925), and the former Liberal Winston Churchill as Chancellor of the Exchequer. This period included the General Strike of 1926, a crisis which the government managed to weather, despite the havoc it caused throughout the UK. At Baldwin's instigation Lord Weir headed a committee to 'review the national problem of electrical energy'. It published its report on May 14 1925 and with it Weir recommended the setting up of a Central Electricity Board, a state monopoly half-financed by the Government and half by local undertakings. Baldwin accepted Weir's recommendations and they became law by the end of 1926. The Board was a success. By 1929 electrical output was up fourfold and generating costs had fallen. Consumers of electricity rose from three-quarters of a million in 1926 to nine million in 1929. In 1929 Labor returned to office, the largest party in the House of Commons despite obtaining fewer votes than the Conservatives. In opposition, Baldwin was almost ousted as party leader by the press barons Lords Rothermere and Beaverbrook, whom he accused of enjoying "power without responsibility, the prerogative of the harlot throughout the ages." By 1931 Baldwin and the Conservatives had entered into a coalition with Labor PM Ramsay MacDonald. This decision led to MacDonald's expulsion from his own party, and Baldwin, as Lord President of the Council became de facto Prime Minister for the increasingly senile MacDonald, until he once again officially became Prime Minister in 1935. His government then secured with great difficulty the passage of the landmark Government of India Act 1935, in the teeth of opposition from Winston Churchill, whose views enjoyed much support among rank-and-file Conservatives. In 1932 Baldwin would tell the Commons: "The bomber will always get through. The only defence is offence." He started a rearmament program and reorganized and expanded the RAF, in the face of strong opposition from the opposition Labor Party. During his third term of office from 1935 to 1937 the worsening political situation on the Continent brought his own foreign policy under greater criticism, and he also faced the abdication crisis of King Edward VIII. With the abdication successfully weathered he would retire after the coronation of the new King George VI and was created Earl Baldwin of Bewdley. Baldwin's years in retirement were quiet. With Neville Chamberlain dead, Baldwin's perceived part in pre-war appeasement made him an unpopular figure during and after World War II. A newspaper campaign hounded him for not donating the iron gates of his country home to war production (they had in fact been exempted on grounds of artistic merit). During the war, Winston Churchill consulted him only once, on the advisability of Britain's taking a tougher line toward the continued neutrality of Éamon de Valera's Ireland (Baldwin advised against it). In June 1945 Baldwin's wife Lucy died. Baldwin himself by now suffered with arthritis and needed a stick to walk. When he made his final public appearance in London in October 1947 at an unveiling of a statue of King George V. A crowd of people recognized the former Prime Minister and cheered him, but Baldwin by this time was deaf and asked, "Are they booing me?" Having been made Chancellor of Cambridge University in 1930, he continued in this capacity until his death in his sleep at Astley Hall, near Stourport-on-Severn, Worcestershire, on December 14, 1947. He was cremated and his ashes buried in Worcester Cathedral. Baldwin was essentially a One Nation Conservative. Upon his retirement in 1937 he had indeed received a great deal of praise; the onset of the Second World War would change his public image for the worse. Rightly or wrongly, Baldwin, along with Chamberlain and MacDonald, was held responsible for the United Kingdom's military unpreparedness on the eve of war in 1939. His defenders counter that the moderate Baldwin felt he could not start a program of aggressive re-armament without a national consensus on the matter. Certainly, pacifist appeasement was the dominant mainstream political view of the time in Britain, France, and the United States. For Winston Churchill, however, that was no excuse. He firmly believed that Baldwin's conciliatory stance toward Hitler gave the German dictator the impression that Britain would not fight if attacked. Though known for his magnanimity toward political opponents such as Neville Chamberlain, Churchill had none to spare for Baldwin. "I wish Stanley Baldwin no ill," Churchill said when declining to send 80th birthday greetings to the retired prime minister in 1947, "but it would have been much better had he never lived." An index entry in the first volume of Churchill's "History of the Second World War" records Baldwin "admitting to putting party before country" for his alleged admission that he would not have won the 1935 Election if he had pursued a more aggressive policy of rearmament. Churchill selectively quotes a speech in the Commons by Baldwin and gives the false impression that Baldwin is speaking of the general election when he was speaking of a by election in 1933 and omits altogether Baldwin's actual comments about the 1935 election "we got from the country, a mandate for doing a thing [a substantial rearmament programme] that no one, twelve months before, would have believed possible". This page was last modified on 20 October 2015, at 14:29.